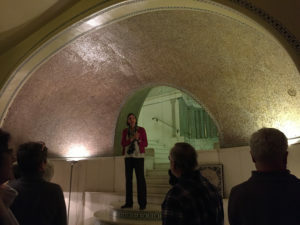 Earlier this year, 30 NEMS members went on a private tour of the mosaics and stained glass at Ayer Mansion, Boston’s Tiffany Treasure. Our tour guide provided us with stories about the family who commissioned the building and put the project in historic context. After the tour, we were treated to a catered reception. A wonderful event. Thanks, Suzanne! If you missed it, you can go on a public tour. 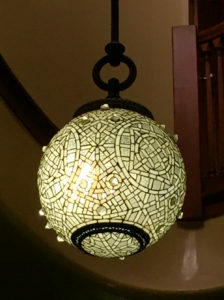 See schedule at http://www.ayermansion.org/Visit.html. Here’s what we learned. The Ayer Mansion was built between 1899 and 1902 for businessman and art collector Frederick Ayer. 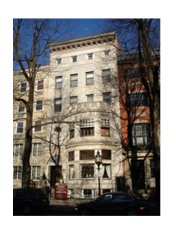 It is the only surviving residence created by American artist and designer, Louis Comfort Tiffany. 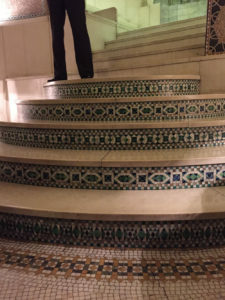 At the Mansion, we viewed the Tiffany-designed stone and glass mosaics, graceful metalwork, Favrile glass vases, custom furniture, intricate plaster work, and elaborate art glass windows as well as exterior mosaics. 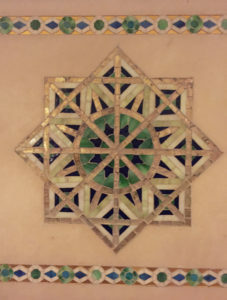 Tiffany was influenced by the art of the East. 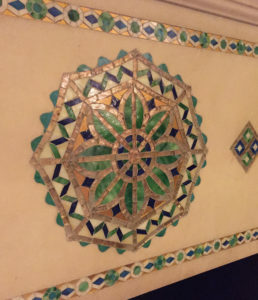 We saw this in the rich Near Eastern patterns and color combinations in his mosaics and glass. 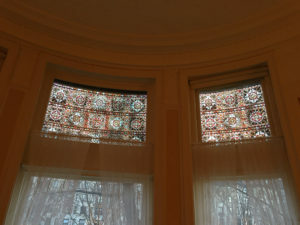 In the entrance hall of the Ayer Mansion, Tiffany combined mosaics and stained glass to transform an ordinary hall into a sumptuous, luminous stage set, perhaps intended for amateur theatricals and musicals. 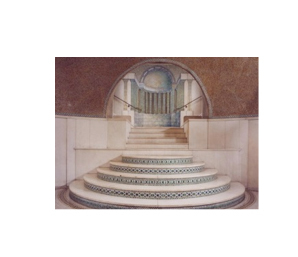 The mosaics of the apse-like stair opening are composed of semitransparent glass backed by metallic foil to reflect light, creating an iridescent effect. 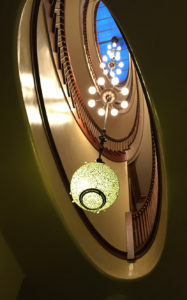 The three-dimensional effect of the tromp l’oeil pavilion on the stair landing was created through Tiffany’s characteristic use of “plating” or layering clear and opaque glasses to add depth of color and three dimensionality. The adjoining marble engaged columns, raised on a slightly projecting plane, further add to the optical illusion.